The demand for maize in South Asia is increasing, with the main driver coming from the growing need for poultry feed. Countries like Bangladesh, Nepal, and Pakistan produce nearly 10 million metric tons of maize annually from an aggregated area of about 2.4 million hectares. This annual yield is achieved mainly through the use of hybrid maize seeds. However, the maize seeds that contribute to these national yields need to be imported, costing these countries millions of dollars annually. Nearly all the demand for hybrid maize seed in these countries has to be met via imports, which often makes retail prices – ranging from USD 4-8 per kilogram – expensive for small holder farmers. The hybrid maize seed industry in Nepal, as in most South Asian countries, is at nascent stage and largely untapped due to a number of reasons including lack of business and investment incentives within the sector, lack of competitive products, and weak R&D by local seed companies. There is also a shortage of ideal technologies and technical expertise across the seed value chain. Participants in the workshop pose for a group picture. Photo: CIMMYT. To address these challenges, the Nepal Seed and Fertilizer Project (NSAF) is engaging Nepalese seed companies in a business mentoring process to enhance their capacity in the testing and deployment of new maize products, business and marketing plan development, and to equip them with the required skills to run viable and competitive seed businesses. The aim is to establish a robust seed system that enhances availability, affordability and accessibility of quality seeds of preferred varieties by the smallholder farmers. 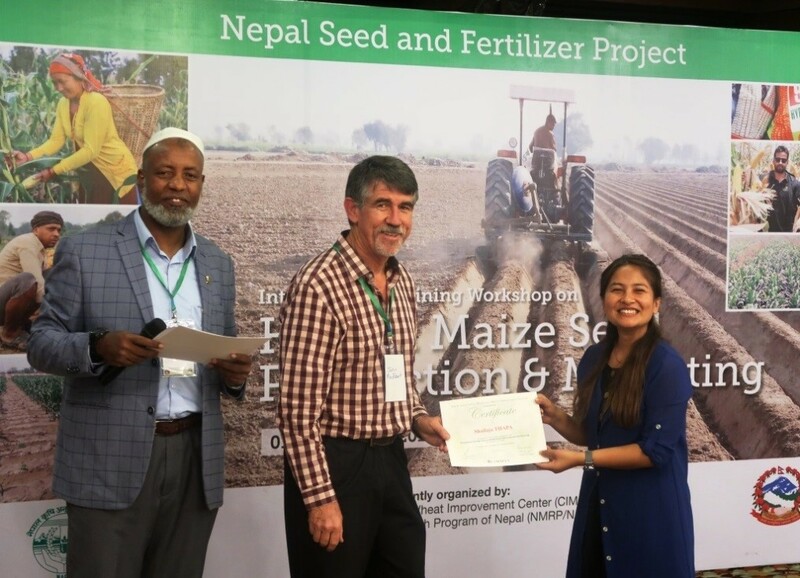 As part of the mentoring process, the International Maize and Wheat Improvement Center (CIMMYT) organized an international training workshop on ‘Hybrid Maize Seed Production and Marketing in collaboration with the National Maize Research Program of Nepal (NMRP/NARC). Held in Kathmandu from October 1-3, 2018, the workshop aimed to enhance participants’ technical skills on seed production and marketing, increase the professional capacity of senior managers in running seed business, and increase understanding of the essentials of hybrid maize seed production and marketing strategies based on experiences from South Asia and Africa. 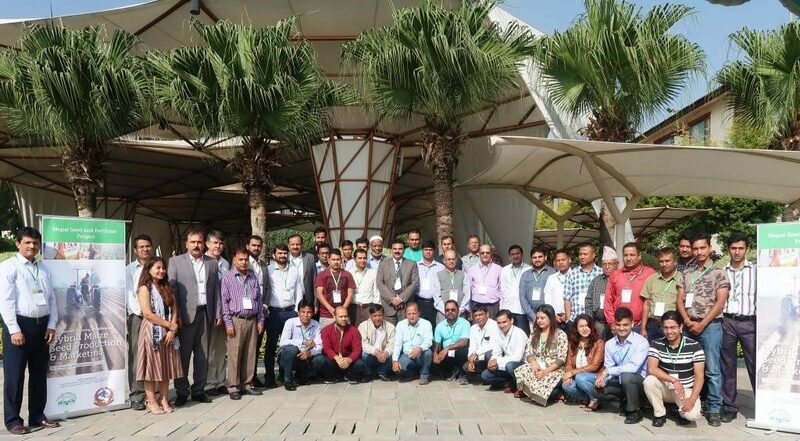 A total of 42 participants representing seed companies and National Agricultural Research Systems from Bangladesh, Nepal, and Pakistan attended the workshop. Addressing workshop participants, Yubak Dhoj G.C., secretary for the Ministry of Agriculture and Livestock Development stressed the importance of hybrid seed self-sufficiency for the Government of Nepal, and shared his appreciation for CIMMYT’s contribution in this regard. B.M. Prasanna, director of CIMMYT’s Global Maize Program, highlighted CIMMYT’s commitment to helping local seed companies in South Asia and discussed strategies for doing so through germplasm exchange and capacity building. Mahendra Tripathi, a maize breeder from NMRP, thanked CIMMYT for organizing the workshop, explaining that the training was “well tailored to the needs of the hybrid maize sector in Nepal” and very applicable to NMRP research program activities. Muhammad Aslam, Assistant Professor at the University of Agriculture in Faisalabad, Pakistan, lauded CIMMYT’s role in bringing together both public and private stakeholders to share experiences and lessons from the region. “My university is the first institution in Pakistan to receive the parental lines of Pro-Vitamin A enriched orange maize from CIMMYT,” he said, “and the training is very helpful in the production of quality hybrid seeds and to maintain the parental lines.” The managing directors of seed companies based in Bangladesh and Nepal commended NSAF’s role in supporting local seed companies in hybrid maize seed and expressed their plan to deliver good quality hybrid seeds to end users. Abdurahman Beshir Issa and John MacRobert present Shailaja Thapa with a certificate at the workshop. Photo: CIMMYT. The workshop concluded with the distribution of certificates and remarks from John MacRobert, who previously worked as seed system specialist and principal scientist at CIMMYT before establishing his own private seed companies in South Africa and Zimbabwe. MacRobert shared advice on how to be profitable in the hybrid maize seed business and emphasized the importance of production, marketing and financial strategies, as well as how to set targets and develop seed production and sales road maps. The NSAF project is funded by the United States Agency for International Development (USAID) and is a flagship project in Nepal. NSAF aims to build competitive and synergistic seed and fertilizer systems for inclusive and sustainable growth in agricultural productivity, business development, and income generation in Nepal.